Pink confessed in a recent interview with Redbook that Mama don't take no silent treatment. The iconic singer admitted that she once pulled off a "sit-in" on the pavement outside daughter Willow's school to get Willow to talk to her about why she was "upset." "Willow won't cry ever, and it annoys me to no end," said Pink, who is a self-described "total crier." "One day I had a sit-in at her school because I knew she was upset and she wouldn't talk to me," Pink continued. "I sat down on the pavement and I was like, 'I'm not moving until you tell me about your feelings, because this is going to be a lifelong conversation for you and me and you have to learn to let me in.'" Willow had the best response of all time. "Without batting an eye, she goes, 'I promise to tell you more about my feelings if you promise to tell me less about yours.'" Oof! Pink was pretty surprised by Willow's response. Pink told her, "Not going to happen. People pay me for my feelings." Still, Pink says that being Willow's mom has taught her "a lot about how to deal with people." She continued, "I process out loud. She does it inside and it scares me a little, but I have to let her go through her process." 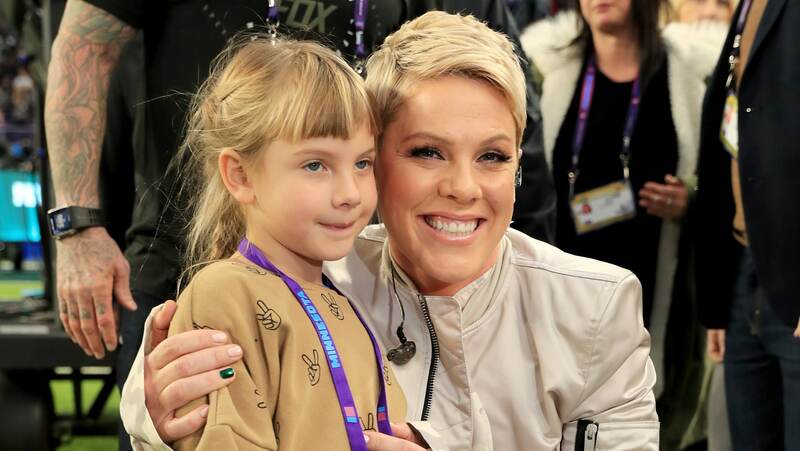 The whole family — Pink's husband, Carey Hart, Willow and baby Jameson — is currently traveling with Pink for her "Beautiful Trauma" tour, making what Pink says are "amazing memories." And Pink says she's savoring every second knowing this together time won't last for long. "When touring stops working for the kids, if they decide they just want to be home and have a normal life, whatever that means, I'll stop, because they are by far the priority," Pink said. "But I think it's cool that they get to see their mom be the boss and work really freaking hard to realize a dream. I'd say it's 95 percent positive." We think having Pink as your mom is a hundred percent positive — although it's cool if it takes a little more time to process that feeling, Willow.